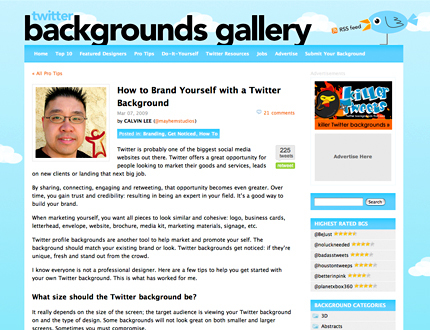 I recently wrote an article for Twitter Backgrounds Gallery website, "How to Brand Yourself with a Twitter Background." In the article, I talk about when marketing and branding yourself, you want all pieces to look similar and cohesive: logo, business cards, letterhead, envelope, website, brochure, media kit, marketing materials, signage, etc. And how Twitter profile backgrounds is another tool in helping to market and promote yourself. The background should match your existing brand or look. Twitter backgrounds get noticed if they’re: unique, fresh and stands out from the crowd. + What size should the Twitter background be? The article is up on Twitter Backgrounds Gallery website now. You can read the full article HERE. Follow @mayhemstudios and @TwitterBGallery on Twitter.